We're very excited to once again be hosting the OVBSAOC Spring Classic rally - our 38th year! Don't miss out, as there is something for everyone at our rallies. 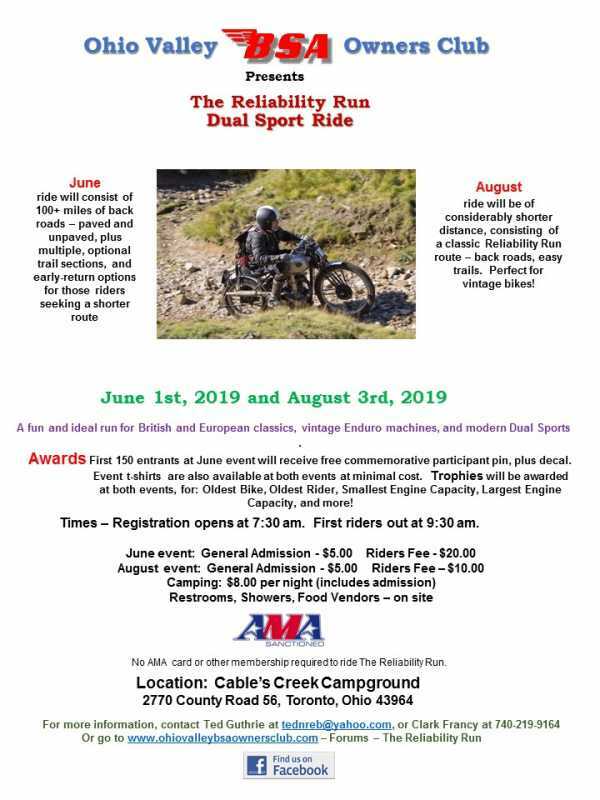 A lovely location, guided road tours, vintage, modern, and youth Observed Trials competition, the world-famous Reliability Run Dual Sport ride, our very popular Small Bore Fun Run, an excellent swap meet, live music, food, camping, and some of the best motorcycle riding to be found anywhere. ALL BRANDS welcome, as this is a BSA-based, but certainly not BSA-exclusive event. Bring your bikes, do some riding, and have yourself a great time. Where can we get a copy of the rules for the spring rally? Table set=up. Vendor registration and restrictions, etc? Thanks!